Collateral :: Movie Information :: RabbitTV GO! Max (Jamie Foxx) is a cab driver who hopes to some day open his own limo company; one night behind the wheel begins promisingly when he picks up Annie (Jada Pinkett Smith), an attorney working with the federal government who is attractive, friendly, and gives him her business card after paying her fare. 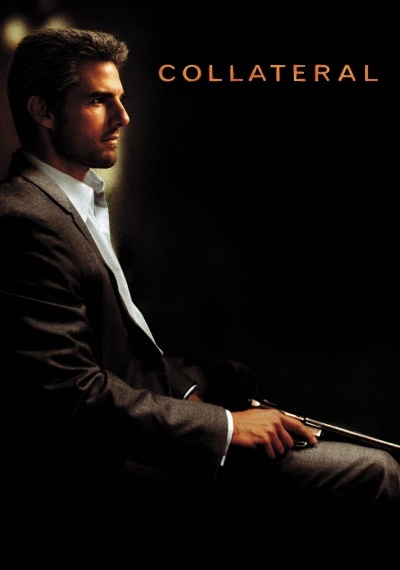 Max thinks his luck is getting even better when his next fare, Vincent (Tom Cruise), offers him several hundred dollars in cash if he'll be willing to drop him off, wait, and pick him up at five different spots over the course of the evening. Max agrees, but he soon realizes Vincent isn't just another guy with errands to run — Vincent is an assassin who has been paid to murder five people who could put the leaders of a powerful drug trafficking ring behind bars in an upcoming trial. As circumstances force Max to do Vincent's bidding, the cabbie has to find a way to prevent Vincent from killing again and save his own skin, a task that becomes especially crucial when he discovers Annie is one of the names on Vincent's hit list.